More complete Listing details and current photos are to follow shortly. The Oceanis 41 was one of the first BENETEAU models to offer the advanced "Hard Chine" hull form for a modern production sailing yacht. The feature provides a comfortable 12-degree sailing angle of heel vis the more traditional 16-18 degrees or so. The interior volume is also enhanced and the overall sea-keeping ability is improved as well. The Cockpit Arch does eliminate the need for a traveler for the main (the rigid boom vang helps with this) and thereby frees up the big Cockpit even more. The support for the dodger / Bimini assists with providing a stable platform for the canvas and the ability to enclose the Cockpit itself as well. 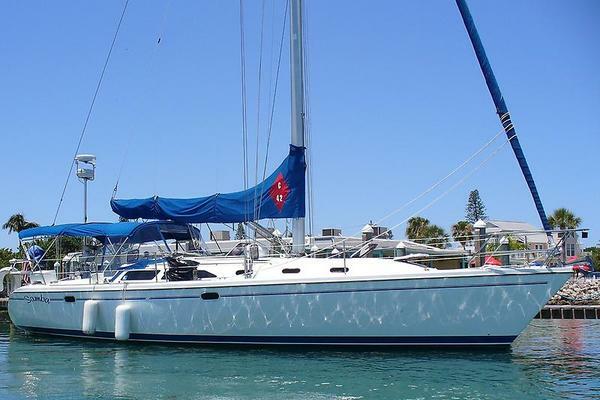 This BENETEAU Oceanis 41 is provided with the Factory Optional Roller-Furling Mast. This is a high-aspect 15/16th Fractional Rig and it is deck-stepped and has double-spreaders. The halyards are internal and all lines are lead aft.